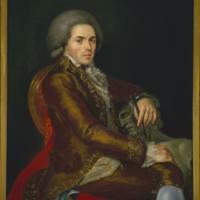 This portrait shows Manuel Tolsá (1757-1816) in a three-quarters view. He lounges in an upholstered chair, wearing an elegant silk suit and powdered wig. As a sign of his profession, as sculptor and architect, he rests one elbow upon a sculpted torso, and loosely holds a stylus. Tolsá appears here as an elegantly-dressed gentlemen. Unlike earlier colonial portraits, there is no inscription documenting the sitter’s history or lineage. Instead, he holds a sculptor’s modeling stylus in his hand, a tool of his profession. The painting’s main diagonal axis connects Tolsá’s head with that of a classicized bust, which Tolsá uses as an armrest. The meaning is clear: Tolsá, like others of his generation, drew fresh inspiration from the classical past. The glimmer of light upon Tolsá’s suit conveys the sheen of the silk, and suggests these were Tolsá’s portrait clothes, not those he worked in every day. Rafael Jimeno y Planes (ca. 1757-1825), a painter and printmaker, is the creator of this image. Arriving in Mexico from Spain in 1794, he was appointed to the faculty of the Academy of San Carlos, the premier art academy in Mexico at the time. So, too, was the sitter of this portrait. Manuel Tolsá is one of the best-known architects and sculptors working in New Spain, having helped foster the neoclassical style that would endure in Mexico through the 19th century. His commissions included parts of the Cathedral of Mexico City and the equestrian sculpture of King Charles IV. This painting is oil on canvas, measuring 108 cm x 82 cm (ca. 42.5 x 32 inches). Today this painting hangs in the Museo Nacional de Arte, in Mexico City. This portrait, both luxurious and severe in its mood, shows one well-respected painter turning his craft to the representation of a fellow teacher at the Academy of San Carlos. 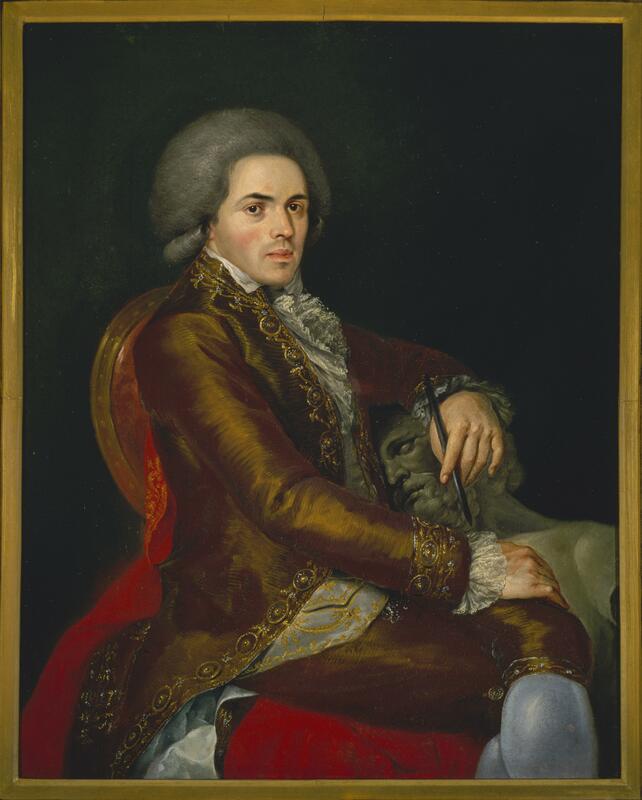 The image thus presents multiple artistic references: Tolsá himself was famous as an ambitious and successful artistic personality in late 18th-century Mexico City, a point the iconography of the painting reinforces. Reproduced courtesy of the Museo Nacional de Arte, Mexico City; all rights reserved. Benson, Elizabeth, ed. 2004. Retratos: 2,000 Years of Latin American Portraits. New Haven and San Antonio: Yale University Press and San Antonio Museum of Art. Pierce, Donna, ed. 2016. New England, New Spain: Portraiture in the Colonial Americas, 1492-1850. Denver: Mayer Center for Pre-Columbian and Spanish Colonial Art at the Denver Art Museum.